I'm not exactly sure what it says about modern humanity, but I'm genuinely surprised that there's no record of a person eating a car. Logically, this shouldn't even be a question worth asking, but most people I talk to are pretty sure someone's done it. But I don't think that's the case, which means a huge opportunity for you. 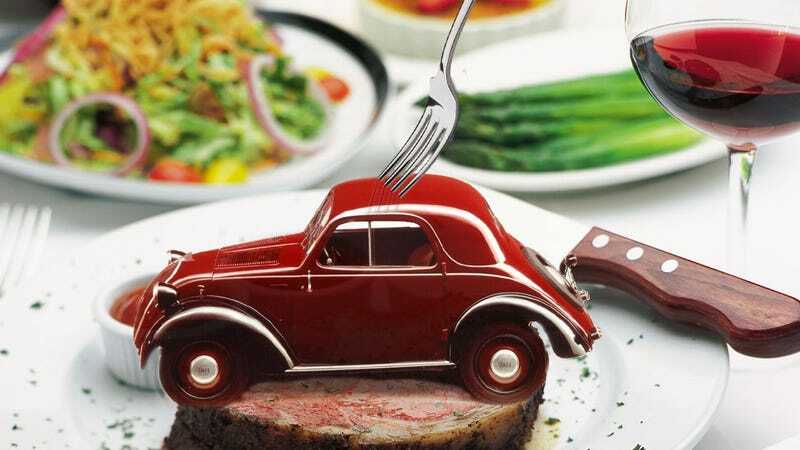 The idea that a person has actually eaten a car is so commonly accepted that I had to figure out why that is. And that why is actually a who, and that who is a Frenchman named Michael Lotito. This is the guy that most people are pretty sure they saw eat a car on That's Incredible or something like that back in the '80s. And they almost did. Lotito should have eaten a car, by any laws of the universe that make sense. Lotito, also known as Monsieur Mangetout (Mr. Eats Anything) did eat an awful lot of normally inedible (and wheeled) things: a bicycle, a shopping cart, a television, about 1200 feet of steel chain, and, his crowning achievement, a Cessna 150 airplane. He ate these things by having them chopped up into swallow-able pieces, and then consuming them with lots of water and mineral oil. Supposedly, he had no issues passing these bits through his body, but so far my quest to find stool samples to confirm this has turned up empty. Still, the big news here is that he leapt from bicycles right to aircraft, completely skipping motorized ground transport. I have no idea why he chose to do it this way, possibly preferring the inherently lighter structure of an aircraft? Or maybe the flavor? In doing other research, I did find a 2000 short film called The Man Who Ate A Car, but it seems to be a work of fiction. Beyond that, every other reference ends up back at Monsieur Mangetout, and he does not seem to have had a taste for the automobile. Which means there's a huge opportunity waiting here for some lucky, hungry go-getter. Lotito died at the age of 57 in 2007 of they say "natural causes," though it's hard to not think a lifetime of eating like the Iron Giant didn't have any effect. Even so, the man paved the way for anyone who really wants to eat massive inedibles, and if he can do it, so can you. So, if you're unemployed or just unsatisfied with how things are going, and really want to make motoring history, this seems like a great chance. Let's face it, designing the next Stratos or 911 is probably not going to happen for you in the next few years, even if you have the training, and most racers only get to the big times if they start winning karting trophies in utero. Eating a car is a solid plan. So, if you decide to take this on, what car would you want to eat? Personally, I think I'd go for something vintage, since they tend to be lighter and likely have less really harmful materials and chemicals in them. Because you know, when eating a car, safety first. I think I'd pick something without too much glass, too, because, I don't know, somehow eating a lot of glass seems worse than eating steel. My pick would be a Topolino. Small, light, not too much glass, old enough to be pretty uncomplicated, and best of all, Italian. Who doesn't love Italian? If anyone's going to make a tasty car, it's got to be them. What wine do you serve with car? Red? I want to say red.